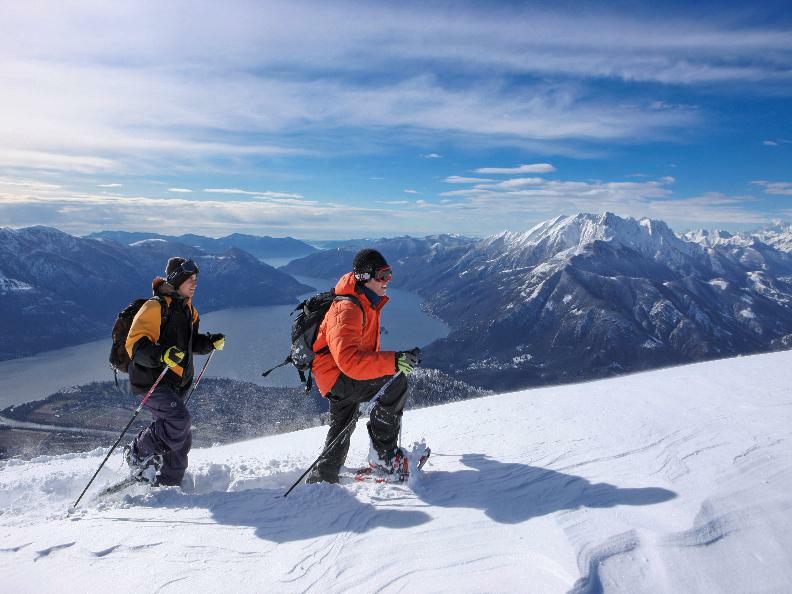 Mild temperatures even in winter and a breath-taking panoramic view year-round: those are just some of the highlights of a snowshoe hike in the Cardada Cimetta. 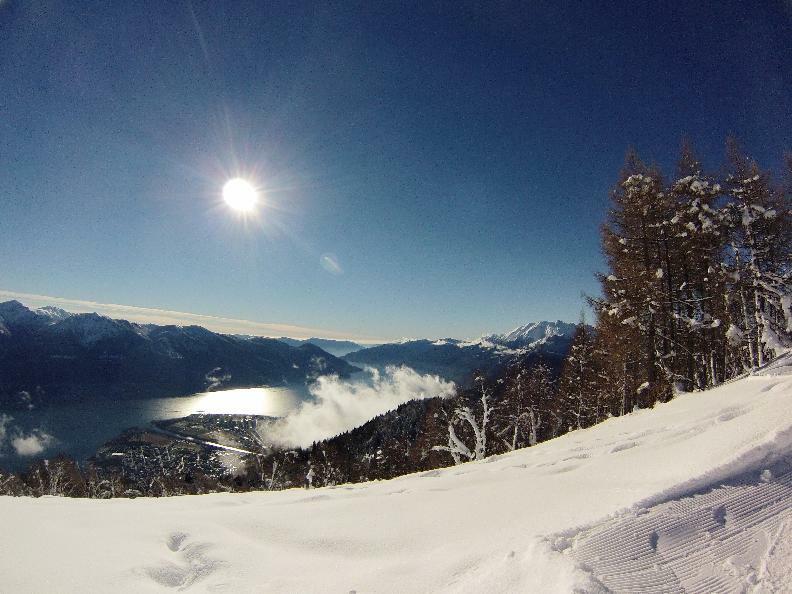 From the local peak of Locarno, one can see both the lowest-lying area of Switzerland, Lake Maggiore, as well as the country’s highest mountain, Monte Rosa. In Orselina, above the pilgrimage church of Madonna del Sasso, is the red gondola that takes you up the 1,000 meters to Cardada (1340 m above sea level). One needs little in the way of previous experience or special equipment to explore this snow-laced fairy-tale landscape on snowshoes. Starting from Cardada, to the right of the exit from the two-person chairlift, the path goes uphill toward Cimetta. About halfway there, one comes upon Mount Cardada, an ideal spot for a break. At 1670 meters, the Alpine region of Cimetta offers a unique 360-degree view over Locarno, to the Ligurian Alps in the south. This view is also unique for bringing together two extremes: Lake Maggiore, at sea level, is the lowest-lying part of Switzerland, whilst the massif of Monte Rosa is the highest. The circular observation platform affords a glimpse into the origin and development of these mountain ranges. Even the Insubric Line, which divides the northern and southern parts of the Alps, is visible here. The Alps arose millions of years ago, when the European and African continental plates collided. The particularities and geologic composition of these plates are explained by informational plaques in the area. Now, using the opportunity to extend one’s summer tan under the mountain sun, one may decide to take the same route back. The chairlift to Cardada runs parallel to the railway. 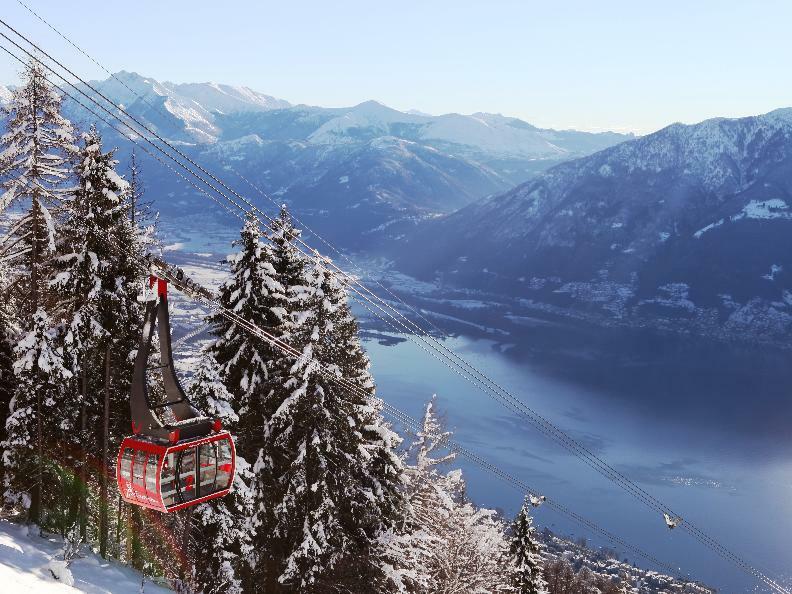 Designed by renowned Ticino architect Mario Botta, this cable railway takes snowshoe hikers back to Orselina.